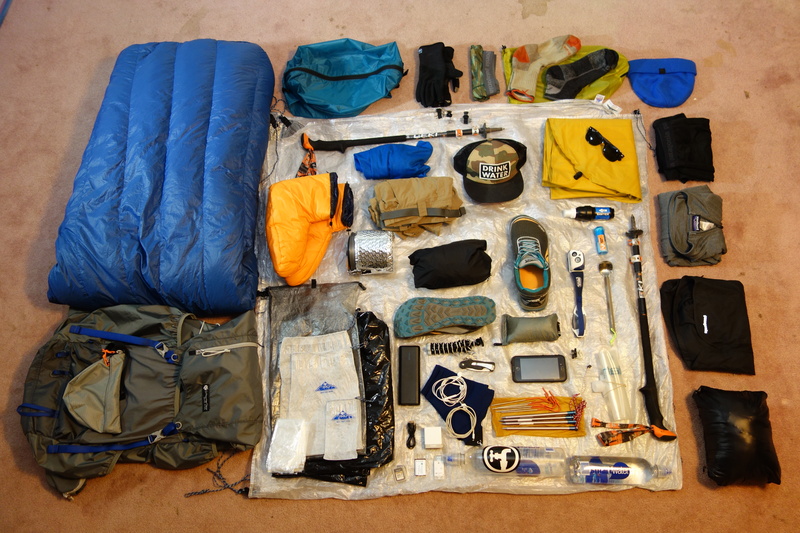 Ahhh, everyones’ favorite post: the gear list! Here she is in all her glory! We’ve come a long way, this gear list and I. It seems like just yesterday she was tipping the scales at 50 pounds and now she’s made her way down under 13, Im so proud of her. 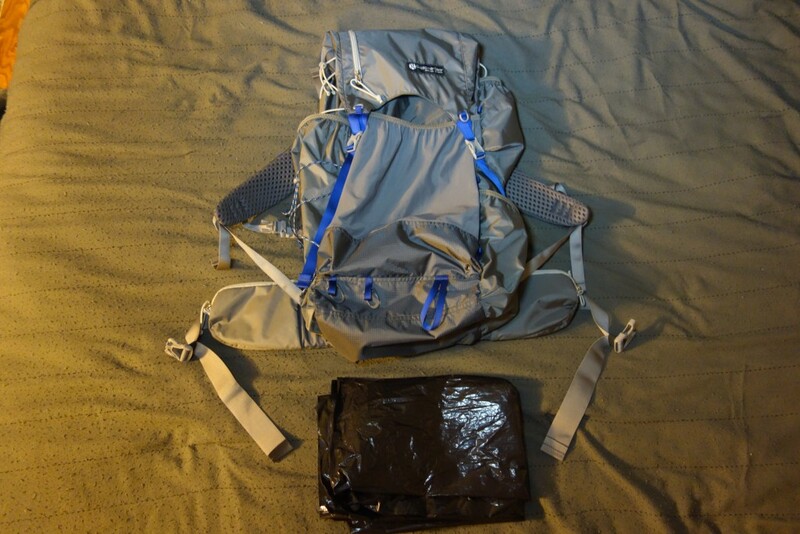 Gossamer Gear Mariposa (29.55oz) – size medium pack/small hipbelt, bits and pieces removed and some cordage added. Trash compactor bag (1.4oz) – this will line my pack and keep everything inside safe from the elements. HMG cuben fiber 8.5′ x 8.x5′ flat tarp (11oz) – includes 6/3ft & 2/6ft guy lines. Stakes (4.3oz) – 6 shephard hooks, 4-8″ easton aluminum spikes w/ cordage, includes stake bag. 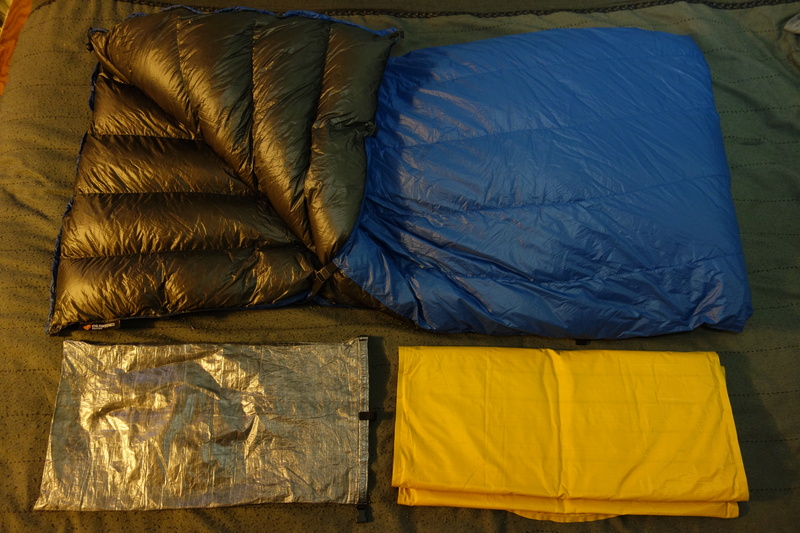 Enlightened Equipment Revelation Quilt (20oz) – 20 degree quilt, 900 fill DownTek, regular length and width, 2 sleeping pad straps included. Zpacks medium+ dry bag ( .9oz) – cuben fiber bag for my quilt. Thermarest neoair xlite (12.6oz) – sleeping pad, regular size. Patagonia UL down hoody (10.95oz) – insulating layer,size medium. Patagonia torrentshell (11.4oz) – rain jacket, size medium. Patagonia strider pro 5″ (4.5oz) – very breathable/quick drying, lots of pockets, size medium. Patagonia cap 4 bottoms (4.7oz) – thermal layer, size medium. Patagonia cap 4 top (6.55oz) – thermal layer, size medium. ULA rain kilt (2.55oz) – rain pants, very breathable. Thermarest fleece pillow stuff sack (1.75oz) – stuff sack for clothes & doubles as a fleece pillow. Enlightened Equipment down booties (2.45oz) – size xl,20d, 4oz APEX 15-30 degree rating.Down socks=the answer to cold feet at night! Darn Tough crew socks (2.55oz) – second pair of socks. 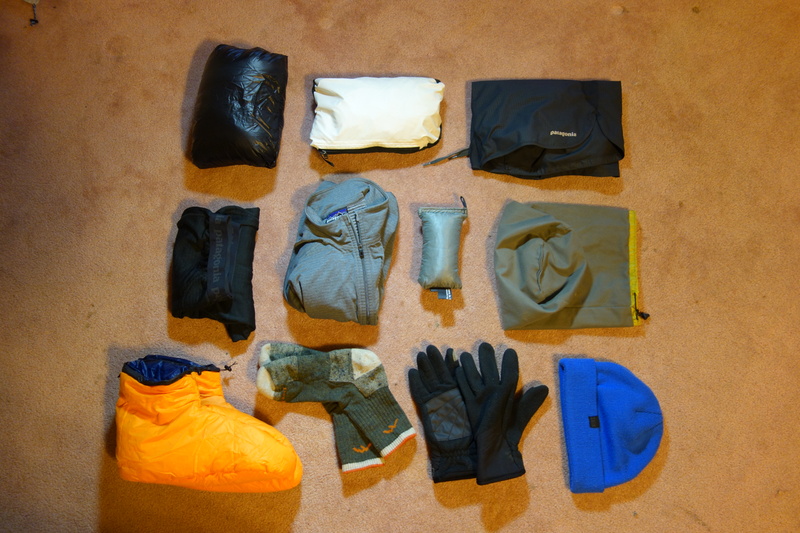 Rei polartec gloves (2.2oz) – touchscreen capability, will be sent home with warmer weather. Smartwool beanie (1.95oz) – wool hat, send home with warmer weather. Granite Gear air zippsack 16L (1.6oz) – food sack. Loksak (1.5oz) – food storage, odor/water resistant. MSR pocket rocket (3.25oz) – nice stove,good simmer control. Leatherman C33x (2.4oz) – knife. Pac-towel (1oz) – camp towel. Platypus 2L (1.3oz) – Dirty water storage. 2 Smartwater 1L bottles (2oz) – cheap, light, nice lids that can double as back-flush system for water filter,all you really need. Sawyer squeeze (3.6oz) – water filter, screw on platypus bottle and squeeze to filter water. Titanium long handle spoon ( .65oz) – utensil, get to the bottom of the pot w/o getting your fingers dirty, easy to clean. GSI soloist pot/cup (9.15oz) – cooking pot, cup, strainer, very easy to clean. DIY pot cozy ( .8oz) – keeps your pot & food nice and warm, also covers pot’s sharp corners from cutting into backpack. Bic mini ( .6oz) – lighter. HMG CF8 stuff sacks x2 ( .3oz) – storage & organization is key in packing. Anker external battery (12.65oz) – 20,100mah battery, bigger battery=less time stopping to charge it. Petzl tikka R+ (3.95oz) – headlamp, rechargeable battery. Headphones/cables/wall charger (4.35oz) – wirez. 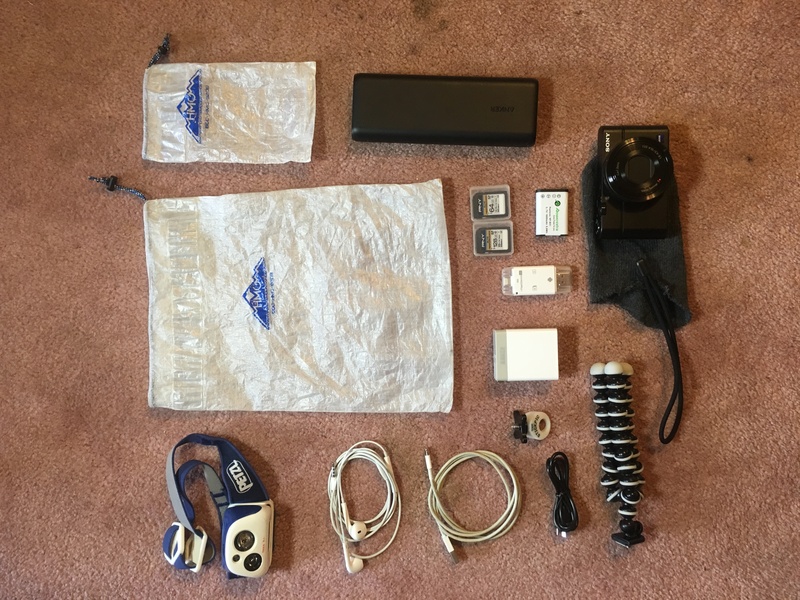 Sony RX100 (9.65oz) – great camera, small but still tons of capabilities, also 3 memory cards, 1 extra battery, card reader for iphone, & sock to protect it included. Mini tripod (1.2oz) – camera angles. iPhone 6s (5oz) – not pictured. camera/phone/maps/etc. 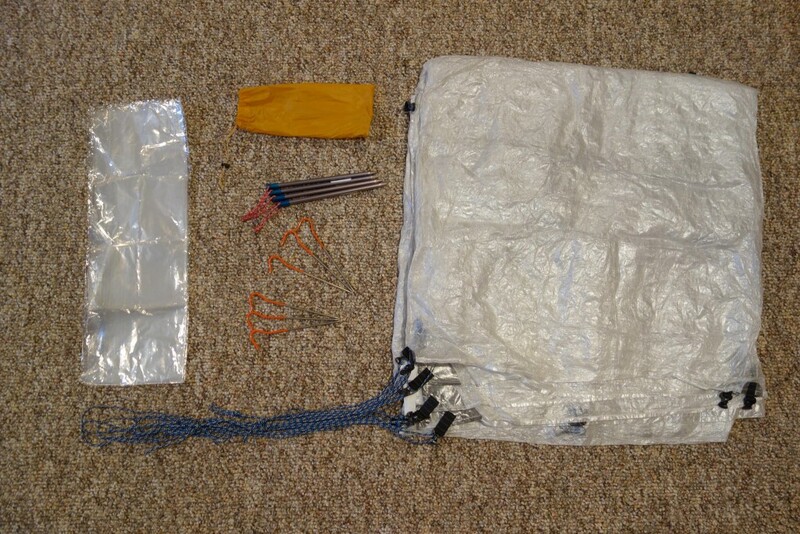 HMG CF8 stuff sack ( .2oz) – pack it all in. 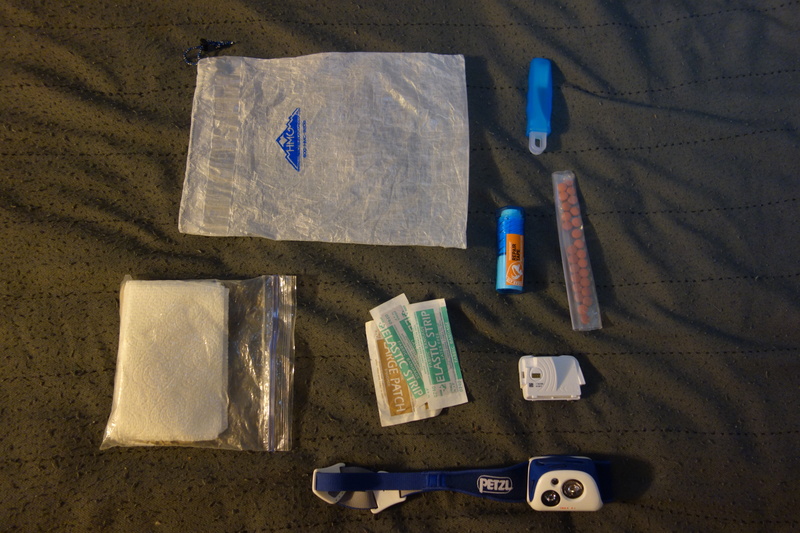 Repair kit ( .9oz) – cuben fiber/air mattress/etc patch kits, needle & thread, toenail clippers. REI sahara (5.3oz) – synthetic t-shirt, quick dry, doesn’t hold smell, super comfy. Colombia silver ridge zip pants (10.5oz) – zip offs, quick drying. Will be sent home w/ warmer weather. Darn tough ankle socks (2.1oz) – great socks, merino wool. Altra Lone Peak 2.5 trail runners (20.9oz) – LOVE these shoes, will be hiking exclusively in these shoes for my entire hike. 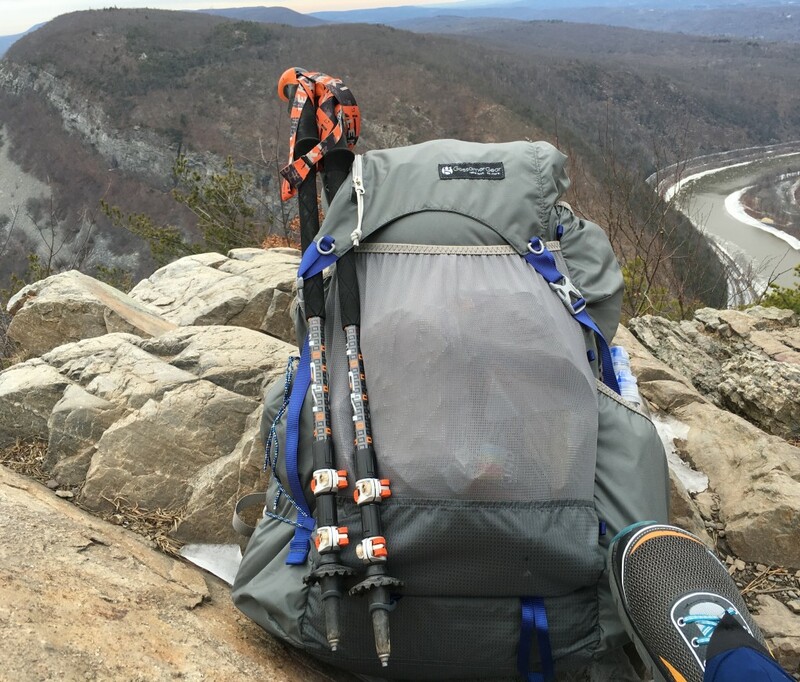 Leki Thermolite XL (16oz) – one of my favorite pieces of gear, have changed my very clumsy feet and constant twisted ankles and helped me to hike farther, faster, and safer, also use them for tarp system as poles. 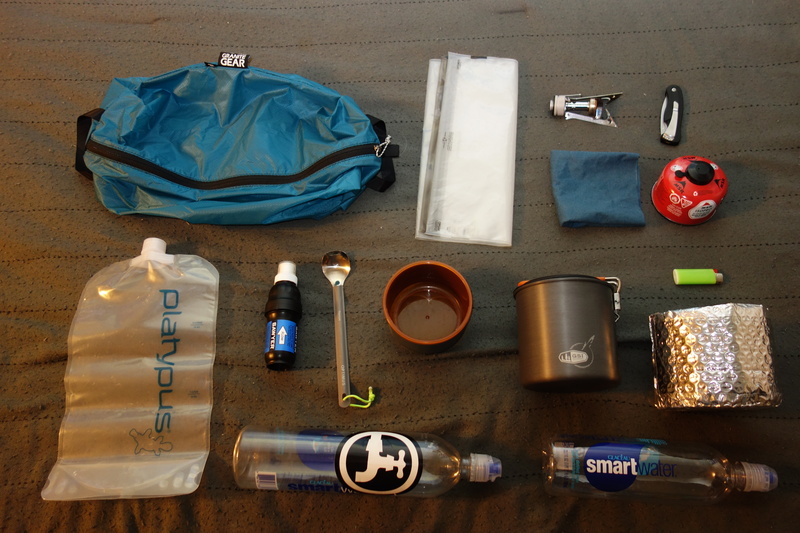 Gossamer Gear Hipster (1.5oz) – fanny pack, great storage with quick accessibility, also +1 for fashion points. Dirty girl gaiters ( .95oz) – cheap,keeps out dirt,stones, debris, less stopping to clean out shoes=more hiking. DIY Drink Water Hat (3.1oz) – $5 ebay hat + $2 Drink Water patch(not pictured). And there she is, my little baby. Coming in right at 12.25 pounds to start off, and she’s only going to get lighter from here! 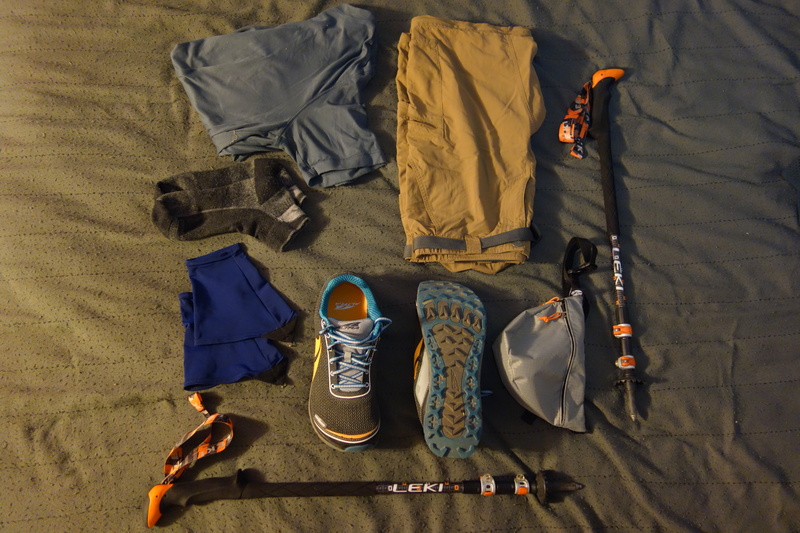 She may not be beautiful to you but she’s everything I’ll need to hike all 2189.1 miles of the Appalachian Trail this year! Shoot me a comment or hit me up on Facebook! Also follow along with me on Instagram! Heading out on my journey TOMORROW!!! So next you’ll be hearing from me will be from the trail! Nice set-up. Well thought out bundle of comfort. Enjoy your hike! thanks! much research and trial and error went into it! I knew I pack was over supplied. I was over thinking it all. Not much time to trial and error. Just research. Clothes are lower on totem pole it seems than basics like gear. So synthetic wins. Hydration a must and comfy makes it good?? I couldn’t believe how much gear was actually in your bag the other day! And how light it all was!!! Cuben Fiber for daaayz! 🙂 God bless you brother! Prayin’ for the journey!